The other night, Ryan and I went to see the Christmas Lights Show on Parliament Hill. Honestly, I wasn't expecting anything too spectacular, but I've got to admit, I was really quite surprised by how great it was! 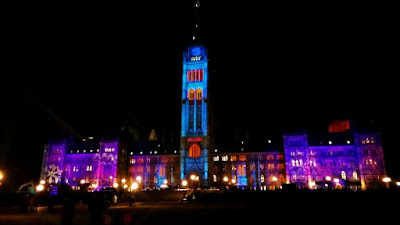 I've seen some pretty impressive lights shows (for those of you who have been to Disney World, you know what I mean! ), and this one was pretty amazing! 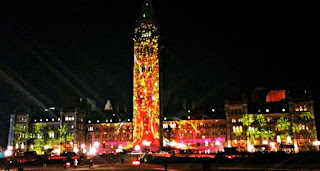 The show, which is about 15 minutes long, runs on a loop from about 5:00pm until 11:00pm, and we got there just in time to catch the show as it began from the beginning. 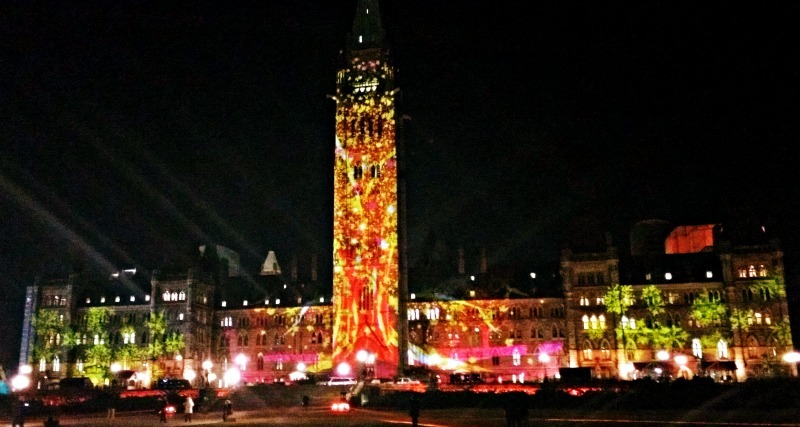 Essentially, the Lights Show is a projection of a Christmas/winter themed short movie, onto the exterior of the Peace Tower and Parliament buildings. There is even perfectly synced music that accompanies the show, which I particularly liked! We brought Rocky with us, and walked around the grounds a bit after the show was over. I don't think he cared much about the Lights Show, but he was a pretty happy doggy to be outside and walking around, instead of cooped up inside and alone! 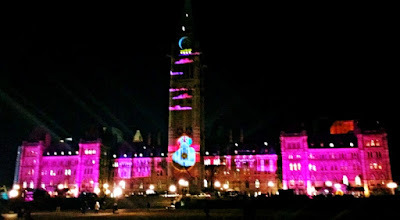 In any case, if you live in the Ottawa region, I strongly recommend going to check out the Christmas Lights Show! Nothing as dazzling as your own smile! Thank you! Such a lovely thing to say! Hello and welcome! My name is Alexandra Emma and I am a lifestyle consultant specializing in fashion, beauty, interior design, and fitness. Sweet Pea Afternoon Tea is a journal of my efforts to continuously enrich my life, all while providing fun, insightful ideas to help inspire others!